Kids Brain Health is mobilizing Network discoveries using the Co-Produced Pathway to Impact. This model emphasizes stakeholder engagement before and throughout the lifecycle of a project. It supports research collaborations to maximize the value of research beyond academic settings so that it makes a difference in lives, health, society and the Canadian economy. Throughout the six stages of the Co-Produced Pathway, our researchers engage with partners in industry, government, and the community/social services sectors. Partners are important intermediaries who transform our research discoveries into products, policies and services that deliver impact for families and children. In most cases, co-creation should begin before the research stage commences, to help ensure the work will be responsive to the needs of partners and the other end users or beneficiaries. At the dissemination stage, when publication and presentation typically occur, we tailor research findings to meet the partners’ needs in terms of the content, type and design of KT and/or commercialization products. We amplify the spread of our findings by leveraging relationships with partner networks and channels with a breadth and depth that researchers alone cannot usually achieve. It is ideal to begin engaging stakeholders as early as possible, before the formulation of research questions, so that the outputs of the research will be relevant to stakeholder needs. Outputs may take the form of a finding, or a knowledge product, such as an infographic, a clear language summary, a video, or a product to be commercialized. Co-production maximizes the likelihood that that these outputs will be useful – and likely to be utilized. The process of engaging stakeholders anywhere throughout the entire cycle from research to impact is called co-production. In application, co-production with stakeholders in an intensive process. Generation of new knowledge. Research findings are the raw materials that are used for the dissemination stage. Knowledge mobilization spreads findings beyond traditional academic publishing and conference presentations. Dissemination can include publishing activities such as press releases, clear language research summaries as well as social media and in person methods, where researchers engage actively with organizations and policy makers seeking information on our research or research expertise. In the context of the Co-Produced Pathway to Impact, the goal of dissemination is to move research out of the academic setting and into practice and policy, where it can progress towards impact. During the uptake phase, partners evaluate the research for its usefulness in informing decisions about public policy, professional practice and/or social services, such as new and/or updated guidelines. Once partners take up research and pass it through internal assessment, they may choose to use the findings when developing new or improved services, policies, products or practices. 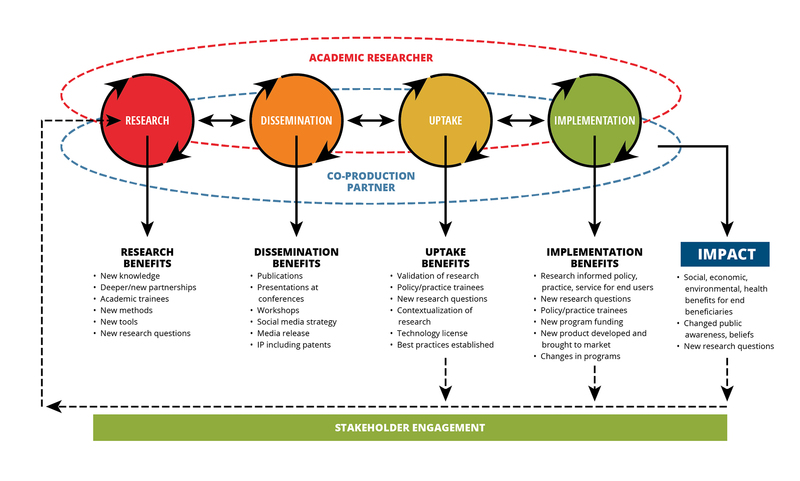 In the context of the Co-Produced Pathway, implementation is an internal partner or stakeholder activity that may include collaboration with researchers and trainees as facilitators. Impact is the effect produced by the research-informed product, policy, service or practice has on end users, as measured by the individual partner and/or partner organization. It may be assessed in terms of service utilization, or gauged by changes reported in the lives of children and families, and depends on the ultimate end user the individual or organization seeks to address.